LETS GET READY FOR ANOTHER GREAT WEEKENDS JUMPING. The weather forecast is looking good for this weekend 28th & 29th of May and we will be open as normal from 08.30am on both days. We might have a few showers around but it is looking good for all students and its getting warmer. If you are a solo jumper we recommend that you get your names down on the list early and your instructors will be ready for you. 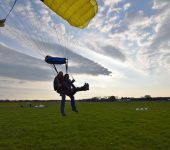 The Irish Parachute Club will feature in a programme called the Claire v Simon challenge this afternoon on RTE2 at 4.30pm and if you are a Tandem student we recommend that you tune in and see what you are going to experience. We can’t wait to see everyone.